When our grandparents were children, the Queen of the Eastern Forests still reigned. 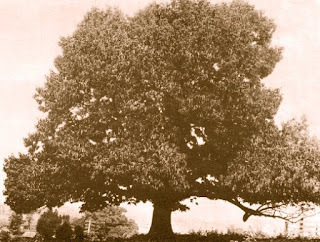 The spreading chestnut, under which Longfellow's village smithy stood, rose more than 125 feet with a trunk 10 feet in diameter. The American Chestnut was one of our most valued trees. Whole houses could be built from its fine, hard wood. Its fruit was a relished food – who hasn’t heard “chestnuts roasting on an open fire” and wondered what real chestnuts must have tasted like? But around 1904, at a Japanese exhibit in New York, an Asiatic tree fungus escaped and during the next two decades wiped out the mighty chestnut from Maine to Mississippi. Well, almost. The chestnut blight attacks only the above-ground parts of tree. Thousands of old chestnut roots still survive in the woods, sending up young trees that may rise 20 feet before being attacked and killed by the fungus. The trees are usually too young to produce nuts from which wholly new trees can grow. Thus, these ancient roots are hanging on for dear life, seemingly hoping for a miracle. And a miracle may be at hand. Scientists are “backcross breeding” the American Chestnut with the Chinese Chestnut, which means they keep taking hybrids of the two and adding more American Chestnut genes by repeated crossbreeding to find the most blight-resistant strains. They hope to get a nearly pure American Chestnut that can withstand the blight and repopulate the eastern forests. While there's little hope for the village smithy, “backcrossing” may one day return the spreading chestnut to its noble size and full numbers. Ancient roots still sending up shoots - that's unbelievable, metaphoric. My ancient roots are trying to sprout a poem about now.